As I posted about yesterday, there was a public hearing on Monday regarding two rezoning applications. 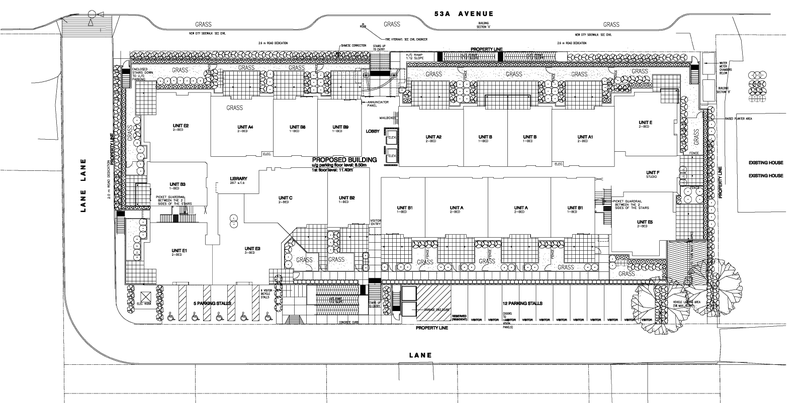 I posted about the rezoning to support a townhouse development along 55A Avenue already. 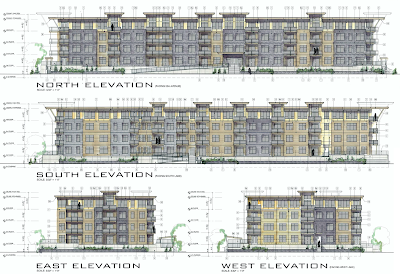 The other application was for an apartment building along 53A Avenue near 201A Street. This development was previously approved by council several years ago, but due to the economic conditions at the time, the project did not go ahead. Some of the changes to the development include the addition of secure bike parking and electric vehicle charging stations. This is really good to see as the project is right next to the future 203 Street protected cycleway. Also, the secure electric vehicle charging may help lower the barrier to EV usage. 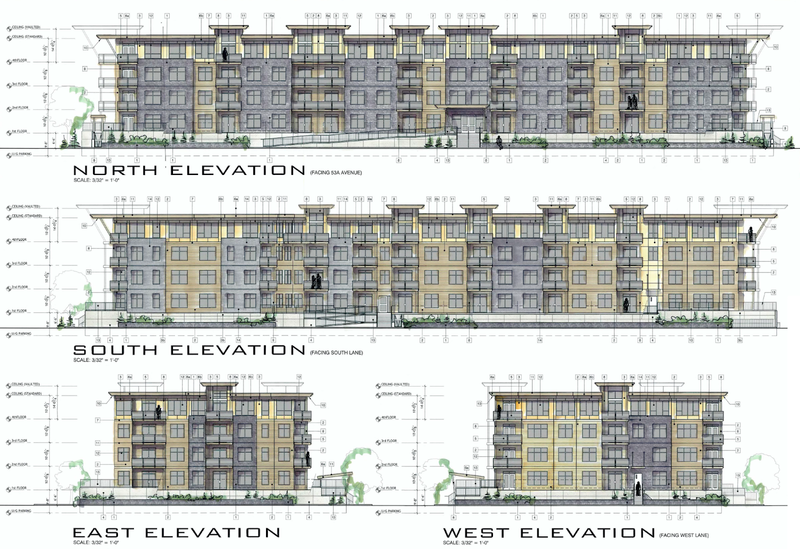 Elevations of proposed apartment near 53A Avenue and 201A Avenue. Select image to enlarge. There were two people that had concerns about the development. One was concerned if the lane was designed properly. City staff noted that it was. Another person was concerned about the loss of private. 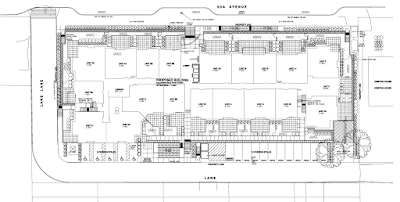 Site plan of proposed apartment near 53A Avenue and 201A Avenue. Select image to enlarge. While not related to the rezoning application, another person was concerned about construction noise and vibrations. Our bylaw officers have been busy addressing the impacts of homelessness over the last little while, and it seems like bylaw enforcement resources might be stretched a bit too thin to address all bylaw enforcement matters. Later on during the regular council meeting, the rezoning application was given third reading with Councillor van den Broek opposed. After the public hearing, there was a Committee of the Whole to allow people to comment on the 2015-24 Financial Plan amendment to support capital road work, improved sewer service, the new Timms Community Centre, and a new fire pumper truck. There was no comments from the public, and this amendment was approved later on during the regular council meeting. Council gave third reading to approve the start of the process of closing a road behind 20797 Langley Bypass. The road right-of-way hasn’t been used as a road since I’ve been around. 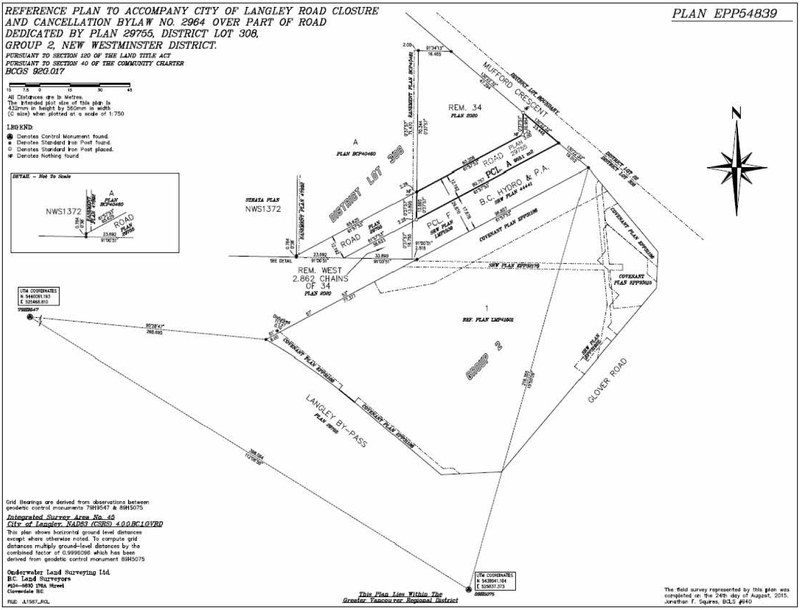 Proposed section of unused road to be closed near the Langley Bypass and Glover Road. Select image to enlarge. Council received various updates at Monday’s council meeting, and I wanted to highlight the engineering update which was presented by Director of Engineering, Parks and Environment Rick Bomhof. The City recently received grants from both the provincial and federal governments. 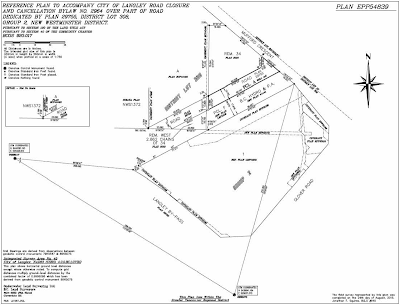 $10,000 will be used by the City to complete a new Water & Sewer Master Plan. The City also received $2.9 million to support the replacement of water and sewer lines under 56 Avenue between the Langley Bypass and Glover Road. The federal government contributed 50% while the province contributed 33%. Bomhof noted that the 203 Street project is going well, and it is expected that the section north of 53 Avenue will be open before Christmas. The remainder of the road should be open by February. Traffic calming is also in the works near Simonds Elementary School along 48 Avenue, and along 50 Avenue near Conder Park. A section of water main near 51 Avenue and 208 Street was also replaced. Finally, new game equipment was installed in Douglas Park, and the bridge in City Park near the pool was replaced.